For the successful operation of the memory it is essential to inject photo-excited electrons form the semiconductor detector into the nanomagnet within short time interval less than 100 ps. The technology of fabrication of a semiconductor-nanomagnet contact with ultra low contact resistance is crucial for this purpose. Fig.1 Comparison of cases of fast and slow spin injections from semiconductor detector into nanomagnet. In the case of the fast injection, the injected electrons are spin-polarized and magnetization of nanomagnet is reversed. In the case of slow injection, all spin polarization decays inside the semiconductor before the injected, the injected current is not spin-polarized and the magnetization of nanomagnet is not reversed. The spin life time in the semiconductor is short. For GaAs it does not exceed 100 picoseconds at room temperature. In design of the proposed memory a short optical pulse excites a spin-polarized electrons in the semiconductor photo detector. Under the applied voltage the photo-excited electrons are injected into the nanomagnet. In the case when the injection time is longer than the spin life time, the spin information is lost inside the semiconductor before it is injected into the nanomagnet. Also, for the same energy of the optical pulse, the amplitude of the injected current becomes lower for the longer injection time. Since the magnetization reversal has a threshold in respect of the amplitude of the injected current, the long injection time significantly limits possibility of the magnetization reversal by the light. The injection time shorter than 100 picoseconds is essential to achieve magnetization reversal by the light with respects to both the electron spin life time and the amplitude of injected current. It is only possible to reverse the magnetization of a nanomagnet by spin-polarized current, when the size of the nanomagnet is smaller than 4 nm x 100 nm x 100 nm. The nanomagnet contact resistance is Rcon=RA*Area, where RA is the resistance-area product for semiconductor/metal contact and Area is the area of contact. Because of very small size of the nanomagnet, the contact resistance Rcon between the nanomagnet and the semiconductor is high, even if resistance-area product (RA) is relatively low. The response time of a p-i-n detector with a nano contact is limited by decay constant t= Cpn Rcon , where Cpn is the capacitance of the p-i-n junction (Fig. 2). In the case when Rcon is high, the injection time t is long. From my experience, to achieve the required short injection time, the nanocontact resistance Rcon should not exceed 10 kOhm and RA should not exceed 100 Ohm um2. It is very low value for a semiconductor/metal contact. The low resistance between n-GaAs and Fe can be achieved by inserting heavily-doped layer at the interface. Three identical samples with only different material of insertion layer were studied. 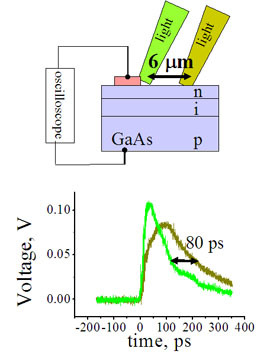 The insertion layer was: a 30 nm of nn-GaAs in which the Si doping concentration is just near to the solubility limit (n=2 1019 cm-3) (Sample 1); a 10 nm of d-doped GaAs in which the Si doping concentration is over the solubility limit (n=2 1020 cm-3) (Sample 2); a 150 nm n-InGaAs graded layer followed by a 10 nm nn-InAs layer (Sample 3). The measured RA was 7000, 250 and 30 Ohm um2 for the Samples 1, 2 and 3, respectively. The time response of the p-i-n photo detectors was measured by sampling oscilloscope on a 50-Ohm load resistor connected between the nanomagnet and metallic contact to p-GaAs layer of the detector. The photocurrent was excited by 170-fs 10-pJ pulses at lambda=860 nm. Figure 3 shows the time evolution of photo-excited current. The injection time was 3 ns, 350 ps and 75 ps for the samples 1, 2 and 3, respectively. For the sample 3, the injection time is shorter than in spin life time in GaAs. Also, in the case of the Sample 3, the peak amplitude of injected current was significantly larger than in cases of Samples 1 and 2. Therefore, the required short injection time below 100 ps has been achieved. Influence of electron saturation velocity on electron injection time. In this experiment I have used a nanomagnet with a little bit large area (1 um2) and low RA 30 Ohm um2. Since the contact area is larger, the contact resistance is small. Therefore, RC decay time becomes even smaller. At first, the electron injection time was measured when the laser beam (diameter 4 um) was in vicinity of the nanomagnet (green line).Next, the laser beam was moved 6 um out of nanomagnet and the injection time was measured again. As can be seen from fig. 4, the injection time became 80-ps longer. Next, I divided 6 um/80 ps= 75 um/ns. I was surprised to find that this number exactly is the value of the electron saturation velocity in GaAs. The electron saturation velocity is the maximum velocity, at which electrons can diffuse in a solid. From this experiment it can be concluded that length of the detector in the spin photon memory should exceed about 6-7 um. 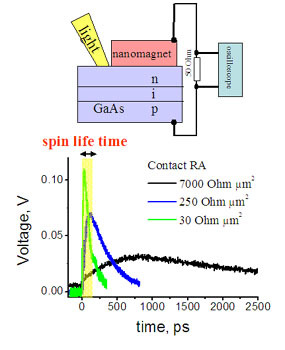 Otherwise, even when a nanomagnet with lowest RA is used, it would be impossible to inject the spin from the semiconductor into the nanomagnet within the spin life time. Fig.4 Influence of electron saturation velocity on electron injection time.